Hernandez retained the IBF cruiser title on scores of 114-113, 115-112 and 116-112 in an all southpaw clash. Hernandez, much taller, began fast but was caught in the third and moments later he fell but now count was issued, which was probably correct. In the fifth Hernandez got caught by another big southpaw left and was hurt and sat down to avoid Ross. The champ had no legs under him for the entire round and held for dear life with ref David Fields watching. In the sixth Hernandez continued to hold while Ross waited too much and by the seventh the Cuban was more steady and was a little more active in a rather passive round. A left in the ninth shook Ross and Hernandez opened up with both too tired to be effective. Ross trainer instructed his man he needed to box more and that blew th fight for the challenger, who probably lost a few even rounds by not working hard enough. To me Ross appeared to have done enough to win but then again to win abroad you must fight hard in every round. Santos won the vacant EU middleweight title with surprise stoppage of Britsch, who was worn down and by the fifth he moved on heavy legs and in at the end of the seventh he was floored by a left hook to the body. Early in the eighth Santos went all out and Britsch was hurt by a left upercut to the head and a left upercut to the body. As he moved away it was stopped. Quinonero well beaten and retired after the seventh. Gerber, cut between the eyes, threw a left hook that was blocked and then a straight right that Sprott for some reason left himself open for and was caught. Sprott went down on his back, got up but was unsteady but appeared to recover quickly - but then referee Gerhard Siegl stopped it. Sprott went mad and pushed the referee, who fell into the ropes and went down. Things calmed down quickly though and Sprott apologized. Gerber appeared to be just a little sharper in an interesting fight. Happoja retained the EU cruiser title as Versaci retired due to a claimed shoulder injury. Versaci lost the first and rocked, was more into it in the second and hurt in the third and fell with only the ropes holding him up. Haapoja landed a follow up punch as well and Versaci got a count and then got through the round and retired in the corner. 78-73 twice and 80-70. Ungiadze was down in the first. Vass down in the first and third. Hardfought with Kretschmann faster and scoring well from his southpaw stance. Hoffmann got stronger as the fight progressed ... but then the rain came and along with the wind the canvas was soon soaking wet and Kretschmann began to slip and all of a sudden the two fighters decided it was impossible to continue fighting and it was called off with a rematch set for Dec 14. The fight was billed as for the "EFA" title - another GBA bs bogus invention. Olougun, a late sub for Konstantin Airich, was off to a good start but then - again - posed a bit too much with Teper working harder without being effective. At the bell ending the sixth Gbenga nailed Teper with a perfect counter and Erkan went down in delayed effect - but no count was issued. Then in the 8th Olougun scored with a solid right hook to the body and Teper doubled over - but it was ruled as a low blow and Teper played it out big time. No scoring announced but with two knockdowns Olougun would have won. Moroseks fought well in a classical USSR style but Belaev kept the pressure up and by the fifth Semjons was in it to survive only. 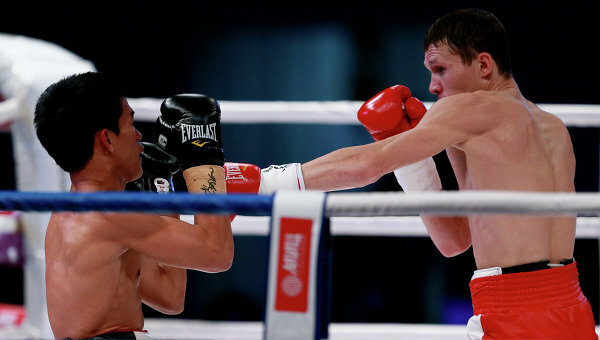 In the seventh he went down three times from Belaev´s bodyshots and all out pressure and it was stopped. Marosi in it for a payday, down in the second and third - the last time ten and out. Frezza defended the national welter title on scores of 99-91,97-93 and 97-95. Frezzo defended the national welter title on scores of 99-91,97-93 and 97-95. Katajisto retained the BBU title on scores of 78-74, 79-74 twice. No knockdowns, Williams had a good round in the fifth but was overall second best. Pastarini was floored in the first and finally dq:d after losing his mouthpiece numerous times. Klitschko retained the WBC heavyweight title as Charr was stopped due to a bad cut around the right eye. Charr was down in the second from a left hook but proved when he attacked that Vitali is past his peak. The cut was caused by a left hook and while it bled heavily it didn´t seem that bad so the stoppage seemed a bit premature - at least from TV. vacant WBC Baltic Silver title. Arich not suspended but have tested positive for steroids after the Solis fight in Texas and is "under investigation". Holub was floored in the first, twice in the third and again in the fourth when the towel came in. Mitras down in the first and stopped in the second. Turmus retired with a suspected broken arm. Pianeta won on scores of 99-92, 100-90 (announced as 100-96) and 97-93. Hammer retained the WBO and WBFed titles on scores of 100-85 on all cards. Hernandez was floored in the fourth and ninth and had points deducted in the eighth and tenth. Profichet won the WBO European title with an upset stoppage over Simcic, who was caught cold, went down, got up but never recovered and was stopped. 60-53 on all cards, Balog was floored in the last. Rolle won the vacant NBA lightheavy title with an easy stoppage of Uzun - who appears to have come in on very late notice. Again, despite suspension after a serious head injury Lindberg sneaks through the big holes in the boxing safety net and stops the washed up Goranova in the second.